Like all other British North American colonies, Newfoundland adopted, in the mid-19th century, a decimal currency consisting of dollars-cents-mils. However, in introducing the new currency in 1865, Newfoundland, unlike other colonies, chose to include a gold coin among the denominations it was issuing. The colony had first considered a one-dollar gold piece similar to that of the United States but settled on a two dollar-piece because the larger coin would be less liable to be lost by the public. 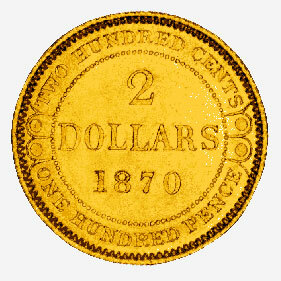 Newfoundland's two-dollar gold piece was coined from 1865 to 1888. The obverse bears a laureated portrait of Queen Victoria and the reverse side, shown, is a simple design consisting mostly of the lettering and the date. This coin is very unusual in that it has the denomination expressed three different ways: TWO HUNDRED CENTS, TWO DOLLARS and ONE HUNDRED PENCE. The latter refers to its value in sterling. This piece is part of the National Currency Collection, Bank of Canada.